Our Broad Bay prison uniform shirts have been used in many convict and prison film projects where authentic prison uniform shirts are required. 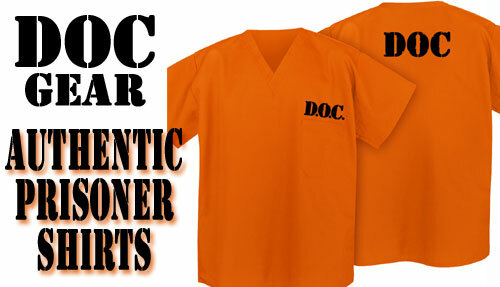 Our comfortable orange DOC prison costume shirts are perfect to wear alone or with our orange DOC prison pants. They make great Orange is the New Black fan prison costumes or prisoner Halloween costumes for OITNB fans! Absolute top quality! Fast Shipping! High Quality Scrub Style DOC Prison Shirt - Great as a Pajama Top After the Party! Unisex V-Neck One Pocket DOC Uniform Styling - For Men or Ladies!